The Day in Pictures: Syrian Basketball U18 Team in Auckland, New Zealand. Hannah Johnston/Getty Images. 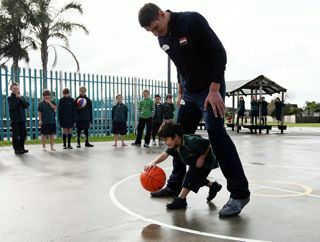 Five-year-old Boston Thompson dribbles the basketball through the legs of 7ft 6' Syrian player Abd Al Wahab Al Hamowi as the Syrian U19 basketball team visit Willow Bank School on June 29, 2009 in Auckland, New Zealand. The Syrian team are in New Zealand for the 2009 FIBA U19 World Championship. Hannah Johnston/Getty Images. 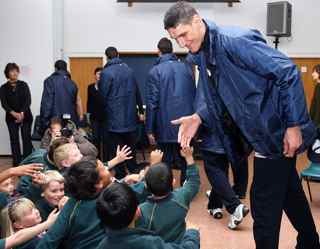 7ft 6' Syrian player Abd Al Wahab Al Hamowi greets school pupils as the Syrian U19 basketball team as they visit Willow Bank School on June 29, 2009 in Auckland, New Zealand. The Syrian team are in New Zealand for the 2009 FIBA U19 World Champiosnhip. Hannah Johnston/Getty Images. 7ft 6' Syrian player Abd Al Wahab Al Hamowi arrives with the Syrian U19 basketball team as they visit Willow Bank School on June 29, 2009 in Auckland, New Zealand. The Syrian team are in New Zealand for the 2009 FIBA U19 World Championship. 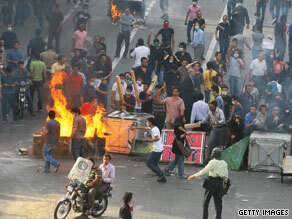 (CNN) - Iranians wounded during protests are being seized at hospitals by members of an Islamic militia, an Amnesty International official told CNN. Ayatollah Ahmed Khatami says rioters in Iran will be 'firmly' dealt with if they continue to protest. NEW YORK (CNN) - A long line of hospital staff wraps around the corridor outside a small conference room in New York to catch a glimpse of the precious cargo. 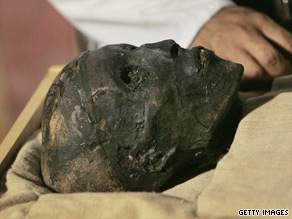 A worker looks at the mummified skull of King Tut in November 2007. Inside are the three frail bodies in open wooden crates causing all the commotion. Another body - a prince no less - is a few rooms down in a computer tomography scanner. The bodies are part of the Brooklyn Museum's collection of 11 Egyptian mummies, transported to the North Shore University Hospital to be scanned. The goal: Find out who they are, how they might have died and establish a chronology of advances in ancient Egypt's mummification techniques. The process is not necessarily new. Egyptian mummies have been exposed to radiographic study since 1896 and CT scans, which conducts imaging by sections, for more than two decades. Perhaps the most famous of them, King Tutankhamun (c. 1355-346 B.C. ), was scanned in 2005 right outside the vault that holds his sarcophagus. The scan resulted in more than 17,000 images that were analyzed by an international team of radiologists, pathologists and anatomists, led by the world-renowned Zahi Hawass, the secretary general of Egypt's Supreme Council of Antiquities. Filed under: Archaeology Egypt U.S. WASHINGTON (CNN) - President Obama has decided to send a U.S. ambassador back to Syria, a dramatic sign of reconciliation between the two countries, senior administration officials tell CNN. The announcement is expected to be made this week. 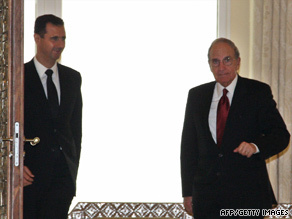 Syrian President Bashar al-Assad, left, welcomes U.S. envoy George Mitchell in Damascus on June 13. "It's in our interests to have an ambassador in Syria, a senior administration official told CNN Tuesday night. "We have been having more and more discussions, and we need to have someone there to engage." The official said that the decision was not in any way related to the election crisis in Iran, although the Obama administration has maintained engaging the Syrian regime could weaken Syria's strategic alliance with Iran. Syrian Ambassador to the United States Imad Moustapha said his country had not formally been notified of the decision, but told CNN if this is true, it reflects the genuine desire by the United States to correct the past efforts of the Bush administration and engage Syria. Johanna Fiore, a New York-based photographer, sent us this contribution after attending the Artists in Exile Exhibit in New York City by Iraqi artists living in Syria - see our original blog entry. Send us your feedback on Johanna's entry and let us know if you'll be attending any events. At a church in New York City on June 20, a gentlemen sat at a large table measuring string to hang paintings. A few pieces were ready for hanging, leaning against the wall. 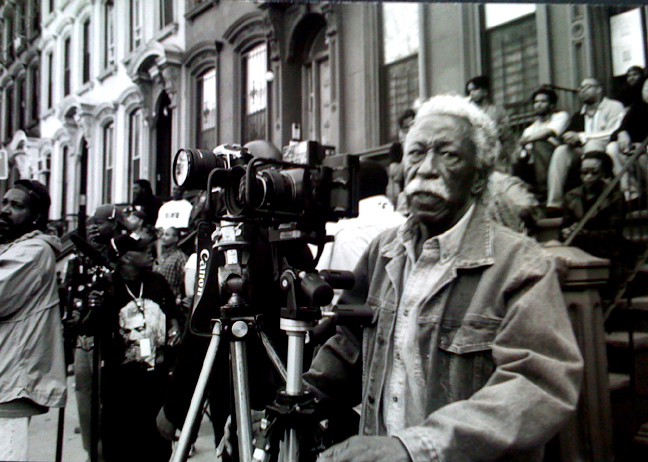 My friend and mentor Gordon Parks in a photo I call 'A Great Day in Harlem' Photo: Johanna Fiore. My first reaction surprised me. It was not an intellectual response; it was purely emotional. My breath was taken away. Here before me, were unbelievable works of art. I had to sit down. The gentlemen, Mel Lehman, told me how he brought these paintings back from Damascus in a suitcase and met the artists in person. His organization, Common Humanity is committed to raising the awareness of Iraqi refugees and displaced persons within Iraq. He was interested in promoting “a human understanding.” I then knew I wanted to help in any way. I spent that afternoon with the paintings. As I learned more about the refugee problem-many questions came to my mind. What is a country’s moral responsibility to the people of Iraq? What is my individual responsibility as an American citizen? We invaded their country, their homes were destroyed and many were forced to flee from their country. My immediate thoughts were that, as citizens, we have a moral responsibility to help in any way. I also realized that I had become numb to the images of war. As I learned more about the United Nations High Commissioner for Refugees and researched the plight of these artists and other refugees, it reinforced my determination to promote the show. To explain why I was so moved, I need to tell you about Gordon Parks. 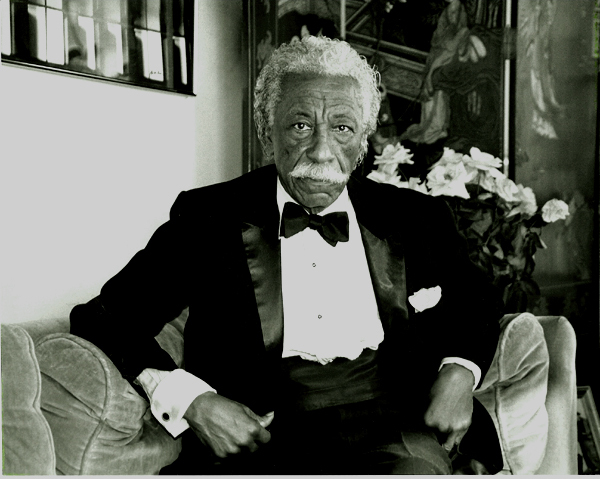 I spent the twenty most exciting years of my life working for master photographer, composer, director and writer Gordon Parks. He was my mentor and friend. His photographs taught me the power of images. His camera was his “Choice of Weapons.” Humble and kind, he lived a life free of prejudice and touched the hearts of many. I feel privileged to have been the recipient of his wisdom and time. All that changed for me when Mr. Parks passed away in March 2006. My world crumbled before me. I lost my job, my grief consumed me, and my passion for life was gone. I experienced the harsh realities of life. I hit a low I have never known. 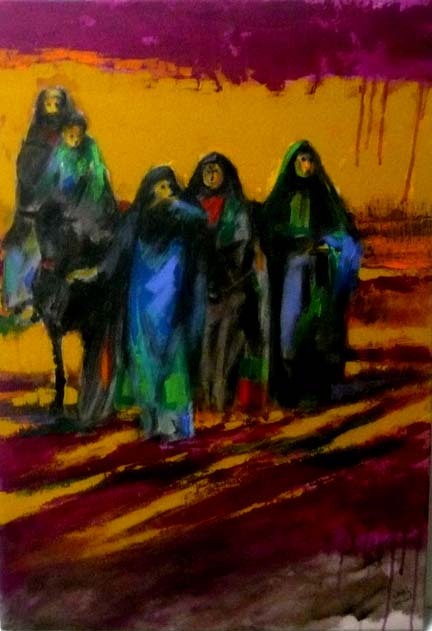 So, when a friend asked if I would like to see paintings by Iraqi refugees, I was interested. After seeing the artwork and hearing their stories, my problems seem miniscule in comparison to what these artists face on a daily basis. Yer they are able to express their individual experiences on a canvas despite their horrendous hardships. The hauntingly beautiful, complex works have a Western influence coupled with such raw emotion that I feel changed as a human being. My energy, creativity, and enthusiasm for life slowly grew as I spent more time with the paintings. What I had lost in March of 2006 was returned to me and for that I am truly grateful. On opening day, June 20, 2009 many people expressed their appreciation and awe of the works. The exhibition space, the Second Presbyterian Church (6 West 96th Street, New York City), lends itself to the showing. The space represents the power of teamwork and commitment to others. Leslie Merlin, the pastor of the Church, works tirelessly for so many causes. 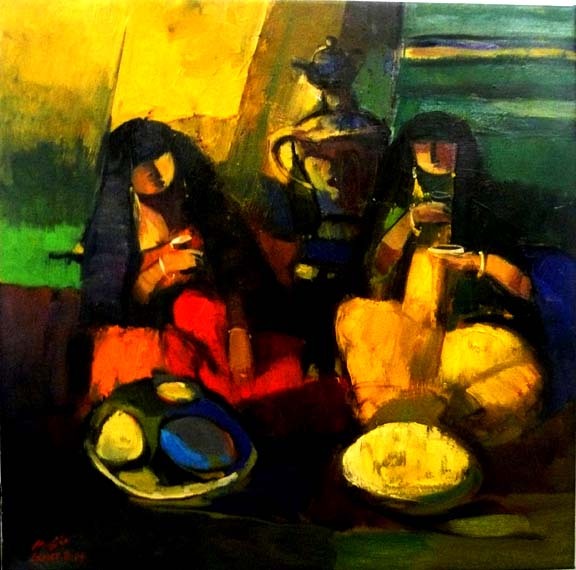 The paintings have already been paid for and any additional funds raised will be donated to the refugees. It has been an inspiration for me to meet so many people who are trying to help others. Artists in Exile: is a true community effort. Filed under: Archaeology Culture Contributors Iraq U.S. PARIS, France (CNN) - The French National Assembly announced on Tuesday the creation of a parliamentary inquiry into whether women in France should be allowed to wear the burka. 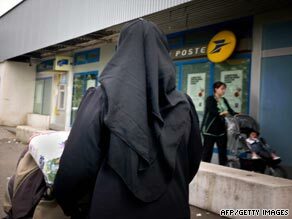 A woman wears traditionnal Muslim dress n Venissieux, near Lyon. A cross-party panel of 32 lawmakers will investigate whether the traditional Muslim garment poses a threat to the secular nature of the French constitution, Agence France-Presse reported. The announcement follows French President Nicolas Sarkozy's declaration in a keynote parliamentary address Monday that the burka, which covers women from head to toe, is "not welcome" in France. "The problem of the burka is not a religious problem. This is an issue of a woman's freedom and dignity. This is not a religious symbol. It is a sign of subservience; it is a sign of lowering. I want to say solemnly, the burka is not welcome in France," Sarkozy told lawmakers. If your musical tastes run towards the more esoteric and global, consider attending Morocco's Gnaoua Festival June 26-29 held every year in the seaside village of Essaouira. 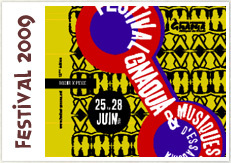 This is the 12th year the Gnaoua Festival is being held in Essaouira, Morocco. Gnaoua (or Gnawa) is type of music indigenous to Northern Africa, characterized by its soulful chanting. In addition to local Gnaoua musicians from Morocco and other Maghreb countries, other participating artists include American alternative hip-hop group Arrested Development, Latin percussionist Jorge Bezerra, Afro-Brazilian-German group Afoxe Leoni and some of the best Sub-Saharan musicians on the scene. *Note from IME Producer: If you plan to attend this event, blog about it! Send us your thoughts, photos and videos and we'll share them on this blog.